A customer in the chemical industry contracted us to manufacture a dual-laminated vessel that was to be used to scrub high temperature gases that were also highly corrosive. Dual-laminate construction was chosen for various reasons; it has characteristics that allow it to handle very high temperatures, its impervious to corrosives, and is available at a very low cost. There are few commercially available products that could withstand the combination of these environments, and none could do so at this cost. In addition the client was seeking a single source solution, one which could supply the vessel and all of the internals in a fully assembled unit. 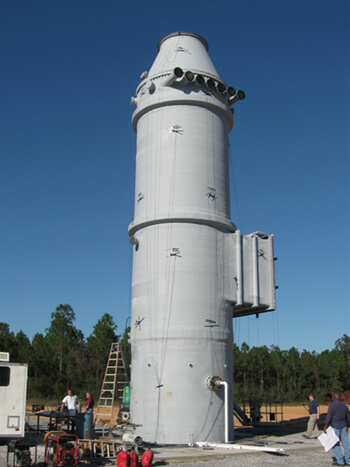 The design required the fabrication of a 4-stage single unit vessel that was 12' in diameter, and 81' high. The assembly required unique integral internal support provisions, high quality fabrication, and precise assembly and alignment. Meeting the customers specification was only one hurdle, it also had to pass a stringent shop performed acoustic emission (AE) test. 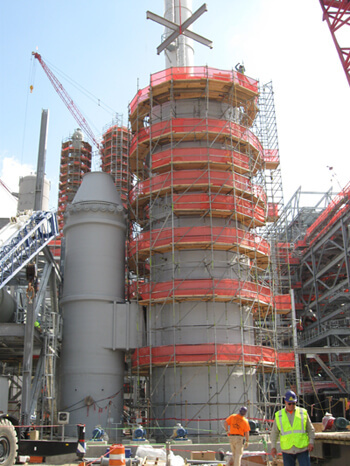 To minimize field handling and erection time the vessel was completely shop assembled including all the vessel internals except for the packing. This vessel also required special handling and shipping provisions due to its extreme diameter to length ratio. After assembly and installation the customer commented that due to the precise vessel assembly the installation time was significantly less than expected. There were no installation problems, as the vessel fit perfectly in its support structure, and matched up easily with all mating piping and equipment. For more on this project, see the table below or contact us directly. Product Description This Process Vessel is used for scrubbing/treating waste gas streams and coal degasification.